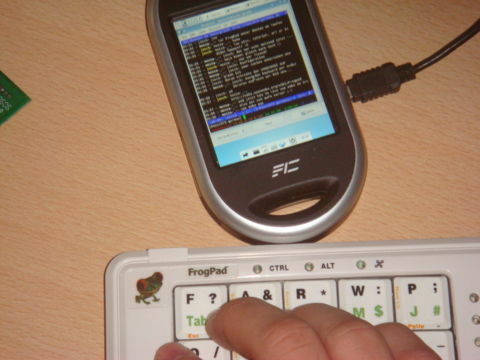 You can use the FrogPad like every normal bluetooth hidd keyboard on your device. Follow these steps to connect to it: [[Manually_using_Bluetooth#Being_able_to_use_HID_devices]]. You can use the FrogPad like every normal bluetooth HID keyboard on your device. Follow these steps to connect to it: [[Manually_using_Bluetooth#Being_able_to_use_HID_devices]]. 1 What is the FrogPad? 2 How can I use it on my neo? The FrogPad is a 20-key keyboard with a special layout which enables you to write with only one hand at nearly normal speed. After roughly 20 hours of continuous training, you should be able to write a text without looking at the keypad at an average speed. How can I use it on my neo? You can use the FrogPad like every normal bluetooth HID keyboard on your device. Follow these steps to connect to it: Manually_using_Bluetooth#Being_able_to_use_HID_devices. #See output from cat /proc/bus/input/devices from above for the event handler. #This should only be used if it doesn't work with the physical adress and the device name. Option          "Name"                  "FrogPad Bluetooth Keyboard"
You can use the FrogPad like every normal bluetooth hidd keyboard on your device. Follow these steps to connect to it: Manually_using_Bluetooth#Being_able_to_use_HID_devices.